Could The Whisperers Appear In Fear The Walking Dead? One of the most significant groups from the comics yet to be introduced on The Walking Dead TV series is the Whisperers, the warped humans who wear walker skins on their faces. 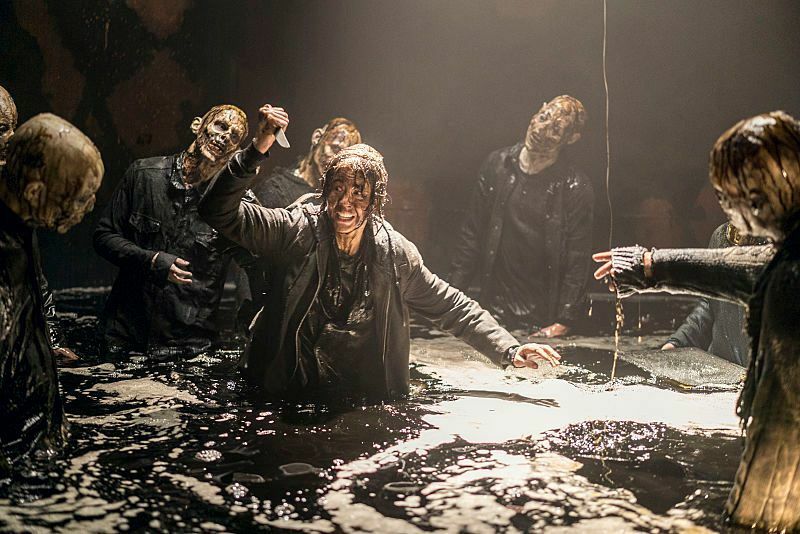 While we’re waiting for official confirmation that the creeps will appear in season 9, what if they’re actually set to turn up in Fear the Walking Dead season 4 instead? That’s what this new photo from the upcoming run of the show suggests, anyway. In it, Jenna Elfman’s Naomi, who’s joining the show in season 4, looks to be in dire straights as she’s surrounded by walkers coming out of the water to get her. Actually, hold up for a second. Is that what’s really going on here? If you take a look at the “zombie” to the left of her raised hand, you’ll see that it has human eyes, which would be a first for a walker in Walking Dead lore. If you think this might just be a mistake by the costume department, then it’s worth remembering how meticulous the attention to detail with the walker costumes on these shows is. Each zombie is made to look unique with very few designs being repeated. So, it doesn’t seem likely that as big an oversight as forgetting to give an actor the contact lenses that distort their eye colour would be allowed to happen. If this is indeed a human disguised as a zombie – aka a Whisperer – then it could be the long-awaited payoff to a seed that was dropped a while ago. Back in The Walking Dead season 3, Lennie James’ Morgan Jones revealed that he’d encountered “people wearing dead people’s faces,” which is a pretty on-the-nose description of the Whisperers. What’s more, Morgan himself is joining Fear this season, so he could be about to face them again. Fear the Walking Dead season 4 arrives on AMC on April 15th. As always, watch this space for more.